Moving right along. 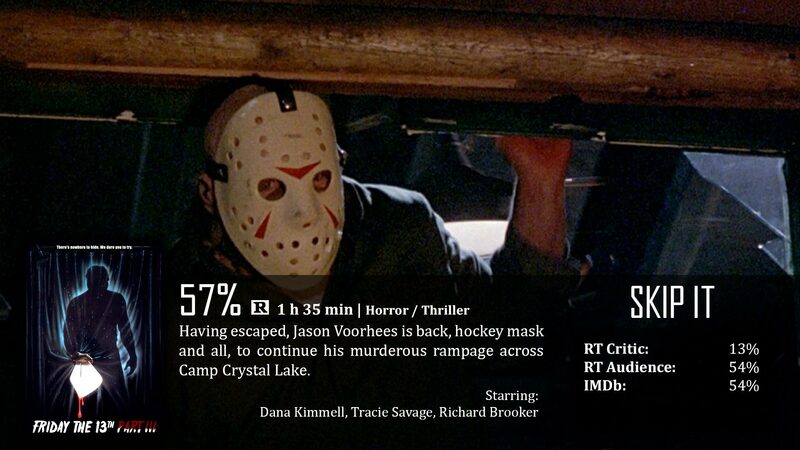 The first film in the Friday the 13th franchise had no Jason or a valid reason to kill anyone on camp, therefore I thought it was forgettable and pointless. The second film in the franchise finally introduced Jason through the legend in a campfire story, positively giving us cause to fear him. The third film introduced what I like to call “modern Jason”, the big buff guy with a hockey mask and machete in his hands. I one thought that I would be more apt to get hooked on the series once the real “Jason” comes around…well…no. Not yet, at least. Friday the 13th – Part 3 just didn’t offer as many new ideas as necessary for a third film in the franchise. Roll out the hippies this time, as they head to a lakefront cottage. Meanwhile, unbeknownst to them, Jason lives and is hiding out in the barn out back. What happens next? Can you guess? Whoever guessed Jason stalks and kills them all? Well to be fair, it is a slasher film, so we can’t just say the film is predictable, because in a way it is supposed to be. We rate this on how many new ideas are introduced the second time around, and in this case, it’s slim to none. Why? All of the ideas the movie could have had were replaced by the innovative use of 3D. Ahh…3D…if there is a horror film franchise out there, you better believe at least one of them will be done in 3D. Why? Because horror is the perfect tool to have as many things stick out of the screen as possible. Well, back in 1982, filmmakers didn’t understand that that was incredibly tacky and ultimately hurts your eyes and gives you headaches. So what does half the film consist of? 3D yo-yo’s, juggling apples, eyeballs popping out, popcorn popping, all done in the perfect angle to have each of these things nearly touch your nose at how close to the camera they get. Also…plenty of impaling moments and knives being thrown in your direction. The main problem is that back then, the only real way to do this is to have whatever it is come straight for the camera from the middle of the shot…so….most of the shots get annoying at how tacky they really are. You don’t even need to have 3D in order for the film to annoy you with the shots. So other than the 3D, what was new about this flick, if anything? Well, they weren’t at Camp Crystal Lake, and I’m entirely sure where they were. I don’t even think it was technically a camp, but it was close enough to believe it was on Jason’s property. We also learn at this point by sheer happenstance that Jason doesn’t really have a weapon of choice, but there is a signature weapon used in all films: the machete. Usually the main characters use it against Jason, but he has been known to handle it as well. The main problem is that this film expects too much from the audience. While sure, not a lot of people would go to see the third film without seeing the other two, you just can’t toss the overall arc’s plot out the window, it’s what the franchise is about. What I mean by that is that the film doesn’t mention Jason, nor his legend or reasonings. That leaves the film…again with meaningless deaths that make no sense. 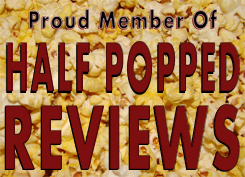 Apart from reviewing films for a modern audience, I also try to review movies as best as I can in terms of a standalone project. The characters aren’t fun, they aren’t memorable, you have no idea who they really are. They apparently have no history. They are, in every sense of the word, lab rats used to experiment on. How can you kill them in different ways than the other two films? How can we make a good 3D death occur? I’m sorry, but Friday the 13th – Part 3 is a really tacky horror flick relying way too much on the old-school use of 3D. 3D that would nowadays hurt your eyes and give you headaches. It’s not looking too good for the franchise right now…but you never know.